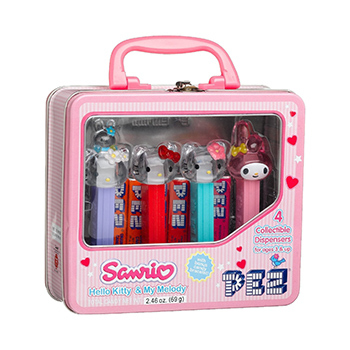 Give someone the gift of being a child again for a moment by giving them the Hello Kitty pez gift tin. The container contains multiple Hello Kitty pez dispensers and candy re-fills. It is a wonderful gift for you care about who love Hello Kitty. Sugar, corn syrup, adipic acid, hydrogenated palm kernel and palm oils, soybean oil, mono and diglycerides, natural and artificial flavors, and artificial colors FD&C red #3, yellow #5, yellow #6, blue #2.